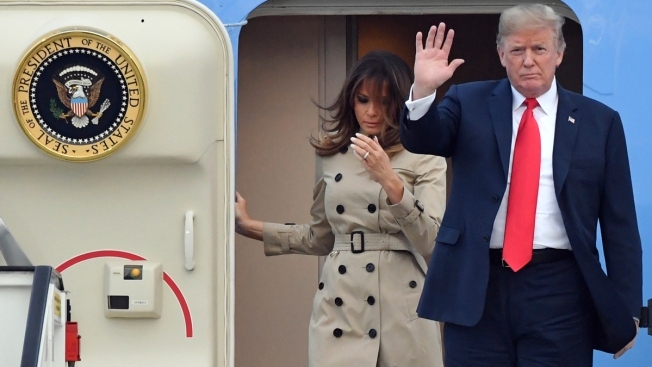 U.S. President Donald Trump and First Lady Melania Trump arrive on Air Force One at Melsbroek Military airport in Melsbroek, Belgium, Tuesday, July 10, 2018. U.S. President Donald Trump is in Brussels to attend a two-day NATO summit. NATO has a shared budget to which each member makes contributions based on the size of its economy. En route to a NATO summit, President Donald Trump is spreading the myth that members of the alliance owe money to the U.S.
His tweet Tuesday: "Many countries in NATO, which we are expected to defend, are not only short of their current commitment of 2% (which is low), but are also delinquent for many years in payments that have not been made. Will they reimburse the U.S.?" THE FACTS: There is no such debt to the U.S. or to NATO. Therefore, no delinquency or question of payment. In 2014, before Trump was president, NATO members agreed to stop cutting their military budgets and set a goal of moving "toward" spending 2 percent of their gross domestic product on their own defense — by 2024. It was not a "commitment," not a direct contribution to NATO, not a payment owed to the U.S., and not something that alliance members pledged to achieve immediately. Trump is right that most NATO members are spending less than 2 percent of their GDP on their defense budget, though more are moving in that direction. Trump has assailed NATO members such as Germany for lagging on their military budgets while he has simultaneously taken credit for progress on that front. He has repeatedly claimed that because of his pressure, "billions and billions of dollars are pouring in," which is also not true, because there is no such fund for money to pour into. It's true the U.S. is "expected to defend" fellow NATO members when they are threatened. It's equally the case that NATO partners are expected to defend the U.S. if threatened. The alliance operates under a mutual defense treaty. NATO does have a shared budget to which each member makes contributions based on the size of its economy. The United States, with the biggest economy, pays the biggest share — 22.1 percent. Four European members — Germany, France, Britain and Italy — combined pay 43.8 percent of the total. The smaller countries pay smaller shares. The funds, totaling about $3 billion this year, are used to run NATO's headquarters and to pay certain other civilian and military costs. No member is known to be in arrears.